Villebillie - The band released their self-titled debut record on September 26 2006 through Universal Motown Records. Villebillies have toured extensively across the U.S. as a headlining act and as an opener for many notable acts. The band was formed in early 2001 through a collaboration between Demi Demaree, lead singer of the Louisville rock band Plan Of Man, and the hip hop production team of Dustin Tucker and William Young. The first demo recordings featured instrumental contributions from Demaree's Plan Of Man bandmates, Adam Goff, Ron Ping, Justin Reid, and Tim Bernauer. By the time of their first live performance on February 16 2002 the lineup had grown to include vocalists Derek Monyhan, Dyllan O'Daniel, and David Mouser. Villebillies performed as a five man vocal act until late 2004 when the group officially merged with Demaree's other band, Plan Of Man. The group began showcasing for major labels and in August 2005 Universal Motown Records signed the ten man band. The band hired producer Toby Wright to record their debut album. Disagreements between the band and producer caused delays and late in the process the band hired Bob Ezrin to produce the final track on the album. 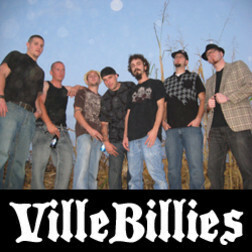 Villebillies major label debut was released on September 26 2006. The band toured in support of the record, headlining large clubs through the south and Midwest and opening for a variety of major acts ranging from hip hop stars like Nelly to country music icons like Hank Williams Jr. In January 2007 after several months of on and off touring David Mouser decided to leave the group. His departure was sudden and unexpected but the band quickly recovered, performing shows with the remaining vocalists filling in on Mouser's parts. In May they headed out on their first nationwide tour in support of Scratch N Sniff Radio, a nationally syndicated radio program based in San Diego, California. The bill included four other acts, (həd) p.e., Authority Zero, Mower, and Danny Diablo, all affiliated with the indie label Suburban Noize. The tour visited over thirty cities across the U.S. and received heavy radio promotion. At the end of the Scratch N Sniff tour the band experienced a series of setbacks that started with the record labels decision not to renew their contract and the subsequent departure of the band's management. The situation was further complicated when Dyllan O'Daniel and William Young left the group to pursue other interests. As rumors of a breakup began to circulate, the band responded by booking shows, posting a new song “Stranger” to the internet, and announcing their intention to release a new album sometime in 2008. The band looked to put a positive spin on their situation. In a December 2007 interview vocalist Derek “Child” Monyhan stated "We're better than ever now, because we're smaller, tighter and smarter.". In the same article vocalist Demi Demaree hinted that the band was taking a more “rocked out” approach. A second new single “One Shot” was released to the internet in February 2008 as an example of the bands new direction. Seven months later the band released their second album, "From the Belly of the Beast".